TOKYO -- Subaru Corp.'s operating profit tumbled 27 percent in the just-ended fiscal year, as foreign exchange losses and spiraling costs broke a three-year run of record financial results. Subaru, which changed is corporate name from Fuji Heavy Industries on April 1, said operating income fell to 410.8 billion yen ($3.69 billion) for the company's full fiscal year ended March 31. Net income dropped 35 percent to 282.4 billion yen ($2.54 billion). The slide ended three straight years of record operating profits and net income, despite that fact that the Japanese carmaker exceeded annual sales of 1 million units for the first time. Revenue increased 2.9 percent to 3.33 trillion yen ($29.9 billion) in the 12 months ended March 31, driven by an 11 percent increase in worldwide sales to 1.1 million vehicles, the company said Tuesday, while announcing financial results. Subaru posted record revenue and unit sales for a fifth straight year. North America, which accounts for about 68 percent of Subaru's global sales, underpinned the sales expansion. Regional sales there grew 14 percent to 721,000 vehicles. U.S. sales expanded to 667,600 from 582,700 the year before. Canada sales grew to 53,100 from 47,600. European sales declined 2.6 percent to 46,000 vehicles, while Subaru volume in Japan and China also posted declines for the fiscal year. "U.S. demand has peaked out," Subaru CEO Yasuyuki Yoshinaga said. "The market environment has increasingly become tougher. We will carefully examine the situation and will take the necessary steps to maintain our sales, including incentives." Yoshinaga said Subaru will adjust U.S. production to slowing demand to clear inventories. Despite the record volume, losses from the Japanese yen's appreciation against the dollar and other currencies broadsided profits, costing 143.8 billion yen ($1.29 billion) in the fiscal year. Other increasing costs, including quality outlays related to the recall of defective Takata airbag inflators, and higher r&d and capital investment lopped another 169.1 billion yen ($1.52 billion) off full-year operating profit. Subaru has paid out more in the past fiscal year to expand production capacity in North America and Japan to feed booming demand. 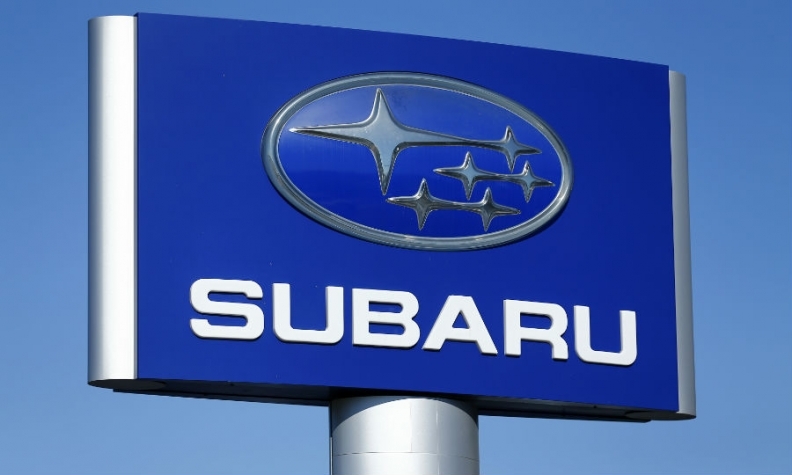 Regional operating profit in North America fell 8 percent to 105.9 billion yen ($951.8 million), as average U.S. incentive spending rose to $1,450 in the just-ended fiscal year, from $900 the year before, Subaru said. Looking ahead to the current fiscal year ending March 31, 2018, Subaru expects rising sales and moderating foreign exchange rates to buoy operating profit and net income. In announcing its full-year outlook, Subaru predicted that global operating income will remain essentially unchanged at 410.0 billion yen ($3.69 billion), in the current 12-month period. Net income is forecast to inch ahead 0.9 percent to 285.0 billion yen ($2.56 billion). Revenue is seen increasing 2.8 percent to 3.42 trillion yen ($30.7 billion), as global sales expand 3.8 percent to 1.12 million vehicles. Sales in North America are expected to climb 3.1 percent to 933,000 vehicles. U.S. volume should increase to 688,000 units, while Canada climbs to 55,000. European sales are seen sliding to 39,000 vehicles. The sales outlook puts Subaru well on its way to its mid-term global sales target of 1.2 million vehicles for the fiscal year ending March 31, 2021. In the company's fiscal fourth quarter ended March 31, operating profit fell 20 percent to 104.1 billion yen ($935.6 million), while net income dropped 24 percent to 74.8 billion yen ($672.3 million). The strengthening yen and higher warranty claims undercut quarterly profits. Global revenue increased 10 percent to 898.1 billion yen ($8.07 billion) in the January-March period, while worldwide sales added 13 percent to 278,700 vehicles. U.S. volume climbed 22 percent to 166,300 vehicles in the quarter. Sales in Canada grew 16 percent to 12,600 units. European sales dropped 12 percent to 12,500 units. Subaru, which had been known as Fuji Heavy Industries since 1953, changed its name to Subaru Corp. to improve brand recognition of its leading products. The move is meant to bolster branding at a company that makes everything from industrial products to helicopters but draws the vast majority of its cash from Subaru vehicles.